In this blog, we are going to get into one of my favorite bands, which is Rush. 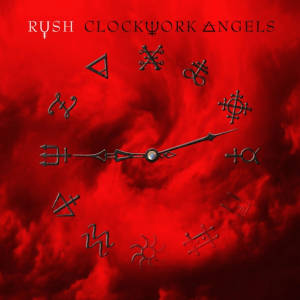 I am going to review their new record, which is called Clockwork Angels. Rush was founded in Canada back in 1968. They put out their first LP in 1974 with the lineup of Alex Liefson, Geddy Lee, and John Rutsey, who was replace the same year with Neil Peart. The history of Rush, Alex and Geddy write all the music while Neil writes the lyrics for all the songs. Neil pulls all his influence for his lyrics writing from fantasy, science fiction and philosophy. They have influence several bands from Metallica, Primus, Dream Theater, etc. They were put into the Canada Music Hall of Fame in 1994 but yet they are not in the Rock and Roll Hall of Shame (I mean Fame) in Cleveland, Ohio. Rush has 24 gold records, 14 platinum records, and 3 multi-platinum records. With cds sales being down they are ranked 79th in the United States with 25 million units sold. They have a total of twenty studio albums under their belt which does include the one I will be reviewing in this blog. They have also put out nine live albums along with 11 greatest hits records. They have put out several music videos, and several other things. Their live show is not explainable in words but they do not have an opening act. They have been known to play for three hours while taking some intermissions. Let us get in into their 20th record called Clockwork Angels which is the follow-up to their Snakes And Arrow, which came out in 2007. This song is very easy to listen to while having a nice guitar riff. The drums like all Rush records is very solid and has a nice bass riff going over it. Mr. Lee is solid as vocalist while doing half million things with his feet. I have no idea how he does it. This is a very solid opening track and was their first single that they put out last year to start warming up their fan base. This is an awesome track featuring everything that made Rush a legend. This next song was my favorite on their single release from last year. I love how there is no break between songs. This is a different start to the song then the single release from the last year. Then it snaps into what the song was last year with the new intro. 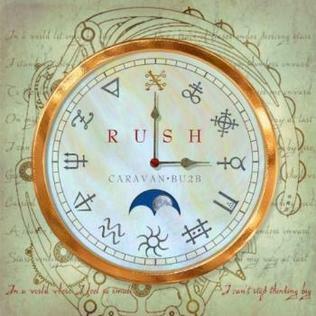 Just like Caravan, it has a nice drum, guitar, and bass line. This song is not in your face but it kind has its moments. They really out did themselves on this song. Great music writing and I hope the rest of the record holds up rest of the way. Now onto the song that is named after this record. The song starts off somewhere in a church or to me in a dessert. That is the one thing for Rush, they will take you on a journey in all their records and music. I really love the sound effects and the guitar is off the chart and the drums just echo what Alex is doing while Geddy is doing his thing in a room alone. This is the slowest of the first three songs but brings you down from the rush you were experiencing at the beginning. This is a very solid lyric song. I love the effect they put on Lee’s voice and how everything comes to a meeting point. It comes back to the nice smooth release of sound journey. The Anarchist starts out with a nice drum beat and the guitar that floats over it. An echoing bass line comes and then the song goes into this space like music art. The classic bass line that comes in the later in the song has made Rush legends comes in with the rest of the great music players in this band. I really love the beginning of this song. It has a solid lyric writing and has an awesome music to back it up to it. I really love the effects that they put on the singer voice and I hope they do not over do it. They been around the block a few times and know they will not over use to the point where it will start to annoying like other bands do with lesser experience. This song is just classic Rush song with a huge modern flare. This song remains me of something that they did back in the late 1970s or earlier 1980s. Carnies starts out with space like music and then comes with a heavy guitar, drums, and bass, It will just calm down a bit and then goes to this space like riffs. This is the heaviest song on this record and it almost rivals any off their Vaper Trails record. It comes with space like lyrics but they are solid. I am really digging the grove of this song. This is classic late 1990s Rush. For being five-minute song, it is just perfect and to the point. It has a very nice ending to the song. Hello Effect is only about three minutes long. It starts out with an acoustic guitar and then kicks into with a little overdrive. It has a nice smoothest to it. I would love to listen to this song with a nice cigar in my hand and think about the future. This song is very dreamy. It has a nice guitar solo if you would call it that. Being the sixth song on this record, Alex has not had too many guitar solos. I am hoping for some in the later part of this record. So far this record is living up to the great music Rush has put out in their career. Rush has not loss a beat maybe a little bit in the mid 1980s but I believe those records were still really good and important to music. Nice bass line to start-up the beginning of the song with the drums echoing it. It has a nice funky feel on the bass line. The guitar is genius place to the side but still over the bass and drums. I feel like I am in a wagon being pulled by horses through a towns of gold. I really love the feeling of this song and the pick up from where the last song left of on this record. All of these songs are produced very well for what the band was trying to put out there. I really love the lyrics in this song. To me, this song could have been three or four minutes long to get the point of the song. I asked for a guitar solo and finally I got it. Alex has a pretty awesome guitar solo in this song. It is simple but yet complex to get to the point. The Wreckers is a straight up classic rock and roll Rush song. This song kind of reminds me of something they did in the late 1970s to 1980s. They wrote a masterpiece in this song. I love how the guitar, bass, keyboards, and drums just come to the dinner table and had a great meal that would make the Greek Gods jealous. This song should have been their first single. I really hope this is a single in the future. This is a hit song and one of the best songs they have written in a long time. It is very nicely done. This next song is their second single release and it is called Headlong Flight. They love their sounds effects but Alex and Geddy puts a nice riff at the beginning of the song that just put me in Oh My God state of mind. The guitar is taking over this song in a very good way. I love the pace of this song. It has a very nice drive to it. The lyrics are very well written and bass playing is off the charts. Drums have a nice impact to the song. I am hearing singing I never thought I would heard from Mr. Lee. I really love the guitar playing in this song. Headlong Flight is something I could have seen off their last record. Wow, I can understand why this song is their second single. I will take back what I said in their last song The Wreckers. Alex has a solo in this whole song. Very well Guitar God! 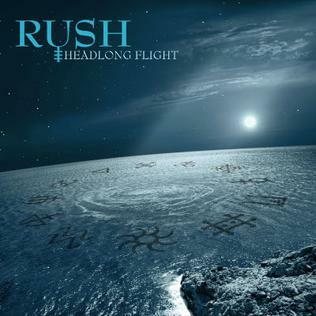 ‘Headlong Flight’ was one of those songs that was a joy to write and record from beginning to end. Alex [Lifeson] and I had blast jamming in my home studio one day before the second leg of the Time Machine tour, and I did not revisit that jam until a year later. Alex and I assembled the song to be an instrumental and its original title was ‘Take That Lampshade Off Yo Head!,” but once we saw the lyrics Neil [Peart] had written, I knew that the spirit of the lyrics matched the instrumental perfectly and it was just a matter of making them fit and writing the melodies. Yes this song resurfaces again. This is an expand of the song earlier in this record but it is a minute and half, which makes it the shortest song on this record. The second shortest song is Halo Effect. This next part of this song gives us a different singing again from Mr Lee. I wished they would have expanded on this idea. Could we be seeing a newer Rush that pushing the limits of themselves? Wish Them Well, to me, is kind of break up song. The song starts out like some 1970s rock and roll song. Wish Them Well is a little popping for Rush but it is still a good song. Repeating the Wish Them Well a few times fits the point of the song. It has a nice driving drum beat and nice support from the guitar and bass. This is a very well balance song from Rush,which is what they are known to write throughout their career. This song is the third shortest song on this record. It is a very written song. The last and finally song off Rush’s Clockwork Angels is a song called The Garden. It has a nice slow start with a nice keyboard riff. It moves to an acoustic guitar with singing while the keyboard riff comes in several seconds later. I love the switch on the guitar part. It is very nicely done and smooth music movement. When it hits the second versus, the drums and bass comes in with a soft touch. This sound has a little Scorpions feel to it. I really like this song. It is very well done. I love this guitar solo towards the end of this song.